Pokemon: LeafGreen Version (Nintendo Game Boy Advance, 2004) COMPLETE! RARE! Pokemon: LeafGreen Version (Nintendo Game Boy Advance, 2004). Extremely Rare complete copy of Pokemon: LeafGreen. Everything is here! Cartridge, Instructions, Promotional Material, and Gameboy Advance Wireless Adapter. All in the box. Box and instructions have some wear, see pictures for details. Bid with confidence. All of my items come from my personal collection and have been treated with the utmost care. See my other auctions for more great titles! Ships to USA only. 4.5 out of 5 stars - Pokemon: LeafGreen Version (Nintendo Game Boy Advance, 2004) COMPLETE! RARE! 300 product ratings300 product ratings - Pokemon: LeafGreen Version (Nintendo Game Boy Advance, 2004) COMPLETE! RARE! Includes 5 empty cases. Cases Have Nintendo DS inscribed on the Inside! We also have Black ones too! These Cases are Clear with Inlays Printed. Pokemon: LeafGreen Version (bought in US). Condition is Very Good. Shipped with USPS First Class Package. Pokemon: LeafGreen Version (Nintendo Game Boy Advance). Condition is Very Good. Shipped with USPS First Class Package. Pokemon LeafGreen Leaf Green Version GBA Instructions Nintendo Game Boy Advance. Condition is Very Good. Shipped with USPS First Class Package. Pokemon: LeafGreen Version (Nintendo Game Boy Advance, 2004). Condition is Acceptable. Shipped with USPS First Class Package. Pokemon: LeafGreen Version (Nintendo Game Boy Advance, 2004). Condition is Like New. Shipped with USPS First Class Package. This has been tested, is an authentic copy, and works well. The label has a bit of wear. 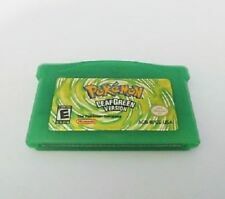 Pokemon Leaf Green (Nintendo Gameboy Advance GBA), Cart Only, Authentic. Condition is Good. Pins have been cleaned. Shipped with USPS First Class Package. Pokemon: LeafGreen Version Authentic Nintendo Game Boy Advance GBA Tested. Cartridge only as shown in photos. WE MARK THE MOTHERBOARDS AND INSIDE PARTS TO PREVENT THEFT FROM SWAP OUTS. We buy all of our item s used. CLEANED AND TESTED. LABEL MAY HAVE LIGHT WEAR. SECURITY LABELS TO PREVENT THEFT FROM SWAPOUTS. Pokemon: LeafGreen Version (Nintendo Game Boy Advance, 2004) - GBA - Saves! Tested and works! - Save Battery Works! 4.5 out of 5 stars - Pokemon: LeafGreen Version (Nintendo Game Boy Advance, 2004) - GBA - Saves! 300 product ratings300 product ratings - Pokemon: LeafGreen Version (Nintendo Game Boy Advance, 2004) - GBA - Saves! You will receive ONE of the games pictured. The game was tested and works great! It is GUARANTEED to be authentic. US BUYERS ONLY Check out my other listings for more deals! Release Data Release Date This Product is USED. POKEMON LEAFGREEN All 386 SHINY GAME UNLOCKED AUTHENTIC! 4.5 out of 5 stars - POKEMON LEAFGREEN All 386 SHINY GAME UNLOCKED AUTHENTIC! 300 product ratings300 product ratings - POKEMON LEAFGREEN All 386 SHINY GAME UNLOCKED AUTHENTIC! Very good condition, working properly as it should. Original, with no damages flaws shown Will ship same to next business day. Very good Preowned Condition. See photos. 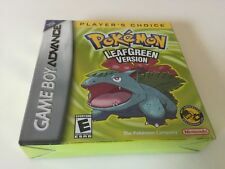 Nintendo Gameboy Advance GBA Pokemon Leaf Green Version . Condition is Like New. Shipped with USPS First Class Package. Check out my other listings. Pokemon: LeafGreen Version (Game Boy Advance, 2004), Authentic, Tested. Condition is Good. Shipped with USPS First Class Package. POKEMON Leaf Green VERSION for GBA/GBM/SP/NDS/NDSL. Has wear as shown but works great! Professor Oak has given you a Pokedex to aid you, as you catch, raise and train Pokemon for battle. Pokémon technology will make its next quantum leap. We've seen the future, and it's all about Pokémon FireRed and Pokémon LeafGreen. LeafGreen Version. Pokemon Leaf Green Version. This is a genuine Nintendo game that was released in 2004. Pokemon LeafGreen Version is part of the Pokemon game collection - pocket edition. ORIGINAL AUTHENTIC Pokemon LEAF GREEN Version Gameboy Advance. Condition is Very Good. Shipped with USPS. Pokemon: LeafGreen Version Nintendo Game Boy Advance AGB-002. Condition is Good. Shipped with USPS First Class Package. Pokemon Leaf Green Version. Title: Pokemon Leaf Green Version. Platform: GB Advance. It is not a picture taken of the exact item being sold. No original case included. Condition: Acceptable. 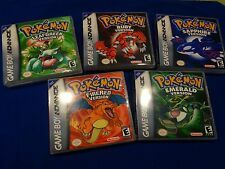 POKEMON LEAFGREEN All 386 SHINY GAME ALL ITEMS UNLOCKED FULL POKEDEX AUTHENTIC!